Gold for neural system, nerves, stress, IQ. heart rhythm, arthritis, libido, brain function. Increased IQ by as much as 25%-35% in latest clinical tests. Very effective STRESS RELIEVER, brings fast stress relief. While when applied topically can relieve stress related aches and pain. Works well together with colloidal copper on joints and arthritis. Can also be effective in treating age and brain related ailments. Clinical tests have shown remarkable increase in IQ when taken regularly for a month, amounting to an increase of up to 35% in IQ which dropped after stopping the daily colloidal gold intake over the following months. Ultrafine Gold. Calms the whole neural system, increases IQ, libido, relieves arthritis + more. 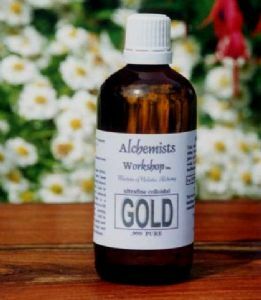 Gold used for centuries in treatment for arthritis especially when used in conjunction with copper, and Parkinsons disease. Gold also helpful with skin orientated problems. We have found, in cooperation with our clients, that gold is also very effective in creating a relaxed condition for meditation and to help acquire a natural sleep pattern while conquering restlessness and wakefulness when going to bed. Very effective in helping maintain the heart's natural rhythm. Also when mixed with colloidal copper extremely effective when treating arthritis both topically and orally. The current pricing of this product reflects an increase in the world price of physical gold over the past year - up from our last pricing of $58.45 which we have heldover for the past year. However I'm sure you will appreciate that we have no choice but to raise our price of our ultrafine colloidal GOLD towards reflecting the current world gold prices. Thank you.